I first made this recipe on a cookery course in Italy. The ingredients are the same but obviously the method is different. There they simmered on the hob for 2 hours whereas here I pressure cook in an Instant Pot for 20 minutes. This recipe produces a beautiful light and tasty ragu that can be served with spaghetti or tagliatelle, layered in lasagna or as a topping for a jacket potato. 75 g bacon streaky, smoked back or pancetta. Chopped. 250 g pork mince or you could just use 500g of beef mince but the mixture gives a lighter and tastier result. Set the Instant Pot to Sauté "normal". Add the oil and when it is hot add the onion, carrot, celery, bay leaf, garlic and bacon. Sauté slowly until the vegetables have softened and the bacon has cooked through. Raise the temperature of the Instant Pot by canceling the Sauté function then resetting it to Sauté "more." Add the meat and quickly brown it in the pot, stirring constantly to break it up. Cancel the Sauté function. Remove the bay leaf and add the rest of the ingredients. Close the lid and turn the valve to "sealing". Set the Instant Pot to high pressure cooking by pressing "Manual" and adjust cooking time to 20 minutes. Once cooked either do quick pressure release if the sauce is needed immediately, otherwise allow the pressure to release naturally. Serve with spaghetti or tagliatelle and a generous sprinkling of grated parmesan. 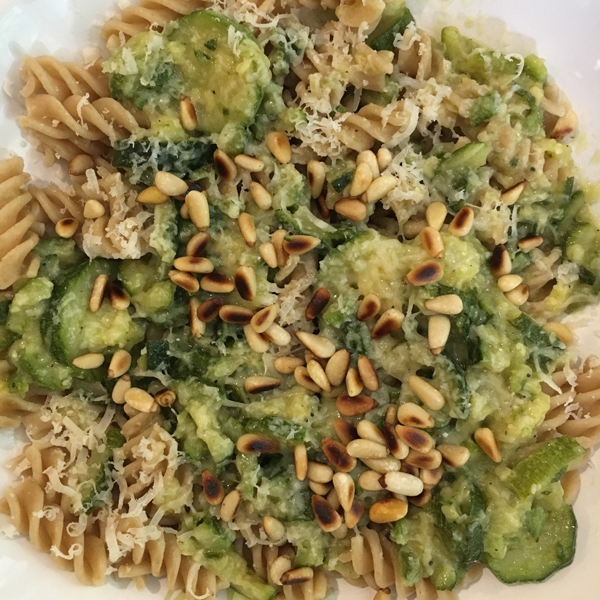 This sauce is a really delicious way of using a glut of courgettes. But no glut necessary! If you are looking for a really simple and quick dinner give this one a go. You could also cook the pasta in the Instant Pot. In which case, make the sauce, set aside then cook the pasta. Once the pasta is done, drain and return to the instant pot and stir in the sauce. The residual heat of the pasta and the pot will reheat the sauce sufficiently. Set the Instant Pot to saute. Melt the butter and the oil in the pot. 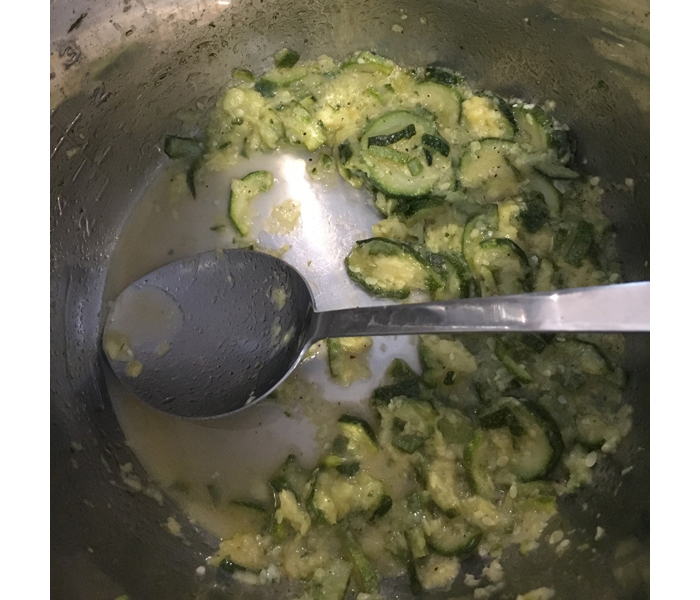 Slice the courgettes in 1/2 centimetre rounds and add to pot. Saute the courgettes, stirring, until they gain a little colour. Stir in the crushed garlic and 1 cup of water then close the Instant Pot. Set to manual and pressure cook for 2 minutes. Do quick pressure release, stir and serve with pasta.